Surf Lessons in Costa Rica is a great way to thoroughly enjoy the warm tropical weather and waves, friendly locals and the beautiful beaches that flank the country. Whether you’re an expert or have never stood up on a surfboard before in your life, or somewhere in between we have the perfect waves we would like to introduce you to through surf lessons. Many of the pristine Pacific beaches offer gentle consistent waves that are perfect for the fledgling surfer. 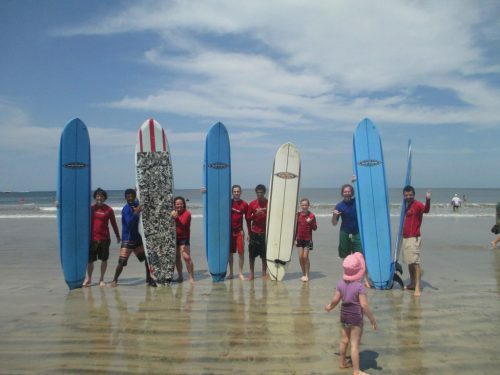 Our very qualified instructors will teach you basic surfing techniques, wave dynamics, surfing etiquette, and ocean safety. Learning to surf in Costa Rica is made much easier by not having to worry about wetsuits or getting cold. The Pacific Ocean ranges in water temperature from 74 to 84 degrees Fahrenheit. Having such a comfortable water temperature allows you and your family to focus on what your instructors is saying and getting your first rides. We can start the day off with a lesson in the morning. Afterwards, we can have a fun filled afternoon of enjoying activities and adventures, or resting, then come back in the early evening to catch the next tide and perfect all the things we learned in the morning. After a day of surfing you’ll have a solid foundation on which to spend the rest of your vacation and probably the rest of your life building on — nobody ever surfs just once! places available to fix dings, buy leashes or even rent boards. Most every beach town has a least one surf shop with knowledgeable help. Although surfing along the beaches of Pacific are most popular, surfing along Costa Rica’s eastern coast, in the Caribbean is also top notch. Some of the more infamous Costa Rican breaks include Pavones, Playa Hermosa, Playa Grande, Salsa Brava, Witches Rock and Ollies Point. However, there are plenty of great breaks that still have yet to be named but have your name written all over them. As with surfing anywhere in the world, the conditions are always changing. We will track down the best breaks for you and your family no matter what your skill level or preferences may be so that your rides in Costa Rican will be the best you have ever had.